Yes someone is going to die and the Missouri Department of Transportation ignores our pleas to try to save lives. Actus reus Latin term for the "guilty	act"
Failure to act, constitutes the	actus reus of a crime. Sadly on Highway DD that crime will be vehicular homicide. Note I omitted the term "manslaughter" because whatever the sad circumstances of vehicles and horse trailers being crushed & lives destroyed. Whomever is at fault per each devastating accident & the preventable homicides; the Missouri Department of Transportation willingly and knowingly failed to correct their aberration of an intersection-that they allowed. They have been warned and yet they fail to act. -Simple malfeasance. And the City of O'Fallon? The city that blatantly shields themselves from any responsibility by waving their MoDOT parking permit. Shouldn't they bear some responsibility of the bloodshed? Despite their squeaks of defense by waving their ever changing permit? This is photo is the entrance of the new O'Day park as viewed from Oak Road to the west. Note the hill and blind curve MoDOT? And City of O'Fallon you designed this nightmare without a proper entrance. Note "Country Roads" drive across the street, on the lower slope with limited visibility to exit. Now visualize the 500 drunks and stoners, wedding and concert goers that the City of O'Fallon plans to enter and then drunkenly disgorge onto Highway DD. This warning- & their knowledge is Mens rea. (Latin: Mens rea, a person's, a city's or MoDOT awareness	that their conduct is criminal. 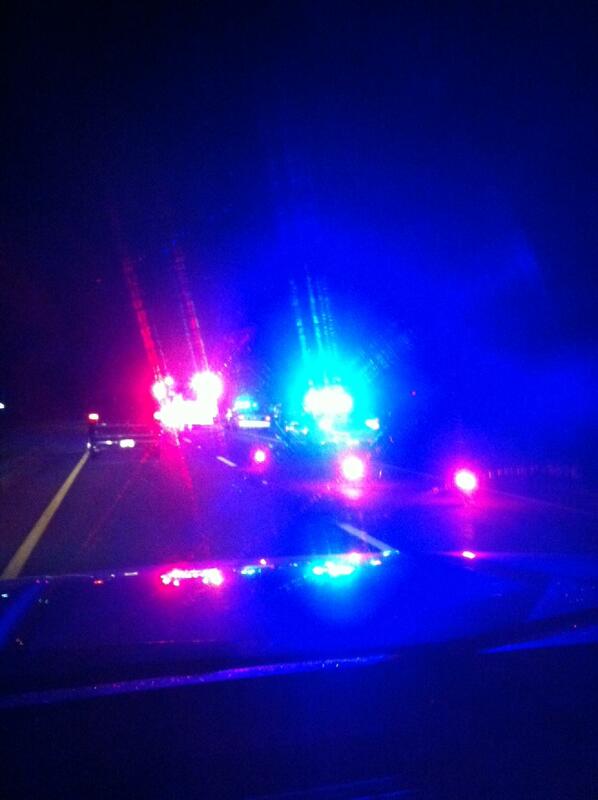 Of course MoDot is aware	of the fact that their conduct will result in vehicular homicide. MoDOT is aware that their conduct is criminal. They approved the permit for the O'Day park without a proper intersection. They approved of the permit allowing the City of O'Fallon to change the amount of parking numbers at will. I took this photo standing in the entrance to the not yet opened O'Day park. Imagine sitting in a low electric car, laughing at the concert you just attended, having to pee from the too many drinks provided by the park venue and pulling onto the curving twisting Highway DD. -of course while texting. My opinion? 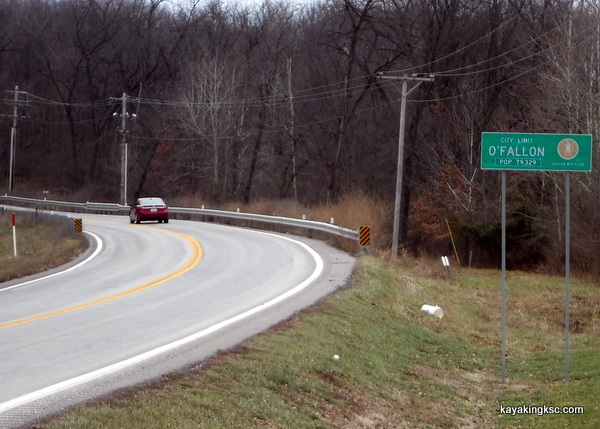 The City of O'Fallon and MoDOT will equally share the burden of the blood spilled. 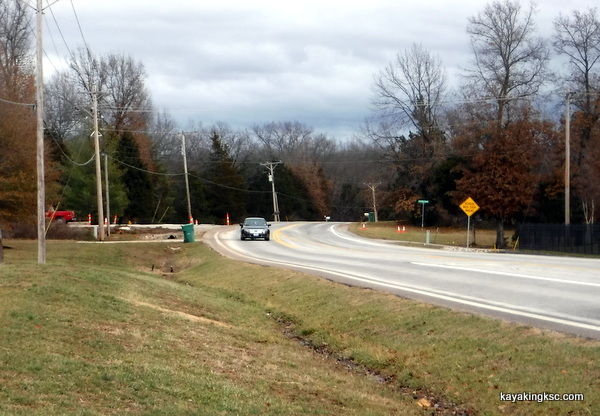 Death and injuries that could have been prevented but for the poorly designed park entrance, lack of stoplight or even a turning lane and the huge crowds that O'Fallon has a permit to disgorge their drunken fools onto a busy rural road. Side note: Perhaps I am wrong. Personally I wonder what is the purpose of the MoDot O'Day Park permit if the City of O'Fallon is allowed to do whatever they wish? This was picture was taken directly across from the O'Day park entrance. Two things struck me looking west. 1. the "Straight away" were EVERYONE accelerates. Everyone speeds up in this area because it is one of the few straight stretches on the entire Highway DD. Normal users of this road will be accelerating while park goers, children, campers or party goers will be attempting to enter the park. 2. And the other thing that caught my eye was the housing development two hundred yards to the west. THEY HAVE A TURNING LANE and that is on a straight section of road. I used Google maps to count 48 houses. 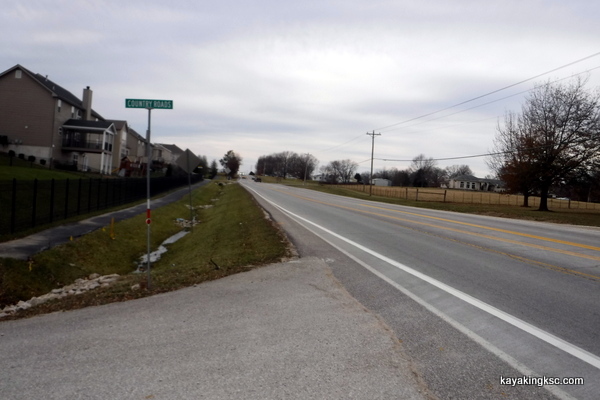 MoDOT made the housing developer install a turning lane for 48 homes, (a hundred cars?) yet the City of O'Fallon which plans on making the O'Day park a hub of activity, with parking for 300-500 CARS does not have to make a turning lane? And the park entrance sits on a curve on a hill? Personally all of sudden this sounds more like corruption than simple malfeasance. Of course I have to be wrong. The view from Country Roads lane looking east, across from the park entrance. I was standing. Now visualize someone in a low vehicle trying to cross this road, with 300-500 cars leaving and entering the park AND dealing with the normal work and winery traffic. The letter to me from MoDOT stated there was no problem here. MoDOT's failure to take the required action to correct both their faulty permit and lack of any intersection guidelines. This purposeful, reckless, negligent absence of action is considered a voluntary action that is an actus reus. When the park disgorges it's concert attendees, the 300-500 cars will be stopped from the park exit to the interstate. MoDOT or O'Fallon do not care. Why should they? I have added my email correspondence to various groups in the Missouri Department of Transportation & THE Missouri Highways and Transportation Commission....and their .....poor response. I requested (begged) that before someone dies, that the MoDOT should make the City of O'Fallon move their O'Day Park entrance so as to disgorge their inebriated park party goers onto the service road by the nearby interstate and not onto the already busy, twisting Highway DD. Thank you so much for your efforts to arrive alive! I am so impressed with the 173 page: Missouri’s Blueprint – A Partnership Toward Zero Deaths that I actually read it twice! Reading between the lines: a labor intensive undertaking from heroes across the state in the hope of saving lives. The stories of the injuries, of the crash survivors & first responders were heart rending. Which of course leads me to write this letter. A concern for the safety of my direct family and strangers whom I dread to meet one day at an accident scene -as in your photos of destroyed vehicles and lives. My elderly mother complained to MoDOT about a new park under construction in St. Charles County by the City of O'Fallon. “O'Day Park” was proposed as a passive green nature park; the City requested and received a MoDOT permit for parking 300 vehicles. Park plans include an amphitheater for concerts, conference center, camping area and a “Lazy River” water park/playground. The complaint by Kim Ryba to MoDOT was that the park 'updated' plans had far exceeded the 300 parking limit permit. Our contention is that the current stated plans exceed the parking limit by approximately 90%-not counting the planned gravel shoulders on the park roads that will serve as overflow parking during concerts. However we received a letter from the MoDOT Chief Engineer in Jefferson City Mr. Ed Hassinger, stating there was “No grounds to rescind the permit”. Disclaimer: I was not going to write a letter until I happened to see Mr. Hassinger's name on the MCRS roster of members. Serendipitous indeed. Saving lives is more important than quibbling over numbers of parking slots. But really if the City of O'Fallon is releasing only 300 drunks onto Highway DD or 600 drunks (by our math) the result is the same. Death and dismemberment on a narrow road. I have to keep repeating that to myself, for I am beginning to have difficulty believing the seriousness of that mantra. Highway DD, like many roads in Missouri is a narrow two lane road where vehicles travel too fast, new developments are adding traffic & school buses. The area is still horse country with animals being trailered, and quarry trucks daily ply the road in excessive speeds. By their own admission; Law enforcement does not enforce speed limits because there are no shoulders on Highway DD & consequently no where to pull over speeders. Law enforcement does do a superior job setting up alcohol impaired driving road checks (at the intersection of Interstate 64 & Highway DD) due to the outstanding successes of the Augusta area wineries. In that mix of quarry trucks and inebriated drivers, rain or ice, breaking for deer, my family drives DD every day and yes they have been in accidents. Obviously the elected council woman is not a member of the MCRS or she might have had a more sensitive answer. Could you possibly send the City a link to your 173 page report on a goal of zero deaths? So MoDOT gives a permit for O'Fallon to release 300 or 600 drunks onto busy DD. That certainly is MoDOT's prerogative. When the concerts end and 300+ vehicles are turned loose at once-with only a mile to the interstate-there will be a line of traffic stalled on DD attempting to exit the park. Driving into that at stalled line? Ah yes the celebratory wine aficionados and our heroic rescue services attempting to navigate that mess. Want to add ice or fog to that scenario? How about the scenario of the quarry trucks driving 70 miles an hour and a family with children or a bus with children leaving the O'Day water park & pulls in front of the heavy truck? 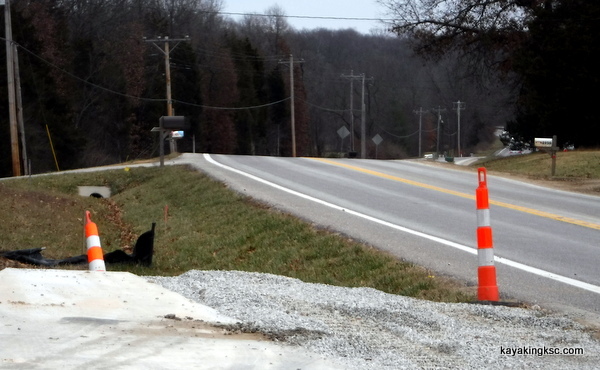 Will MoDOT offer a too-late apology at their error in judgment? What about the people that live on the road directly opposite of the park entrance that will no longer be able to make a left (west) turn because of traffic entering the park? They will have to cross both lanes, enter the park and make a u-turn just to travel west. That is unless the line coming from the east is blocking the park entrance. Did MoDOT consider the problems and potential disasters? From my understanding of MoDOT regulations, there should have been a turning lane into the park, because the entry from the east is on a slight curve which reduces the line of sight. -Believe me when I say I would have rather been at the dentist than reading MoDOT regulations. From my understanding the turning lane was not required because the O'Day Park was going to be a passive green park with limited traffic-say day hikers and picnickers. My understanding is there was an “omission” by the City of O'Fallon to MoDOT, -you can say accidental omission if you wish; about the weekly (parties) concerts & weddings at the park. Well the good ol boys are never really held to account. HWY DD + wineries+ Oday park concerts+ 500 beer drinkers and the Bar Charts on the MCRS fatally reports are going to jump to the top of the page. Forgive me for being flippant. That is sad, that is terrifying. My family is at the mercy of the wisdom of both MoDOT and O'Fallon. They are at the mercy of “Deadly DD” as it is becoming known. I omitted that the new O'Day park will have a teen center. So in addition to the drunks and stressed parents will be teenagers leaving the park while texting-normal every event added to this terrible scenario. The City of O'Fallon in their own meeting minutes have stated the goal of capturing business in this park: Weddings, conventions, teens, children and concert goers. Their stated goal is to take business from the surrounding St. Charles area. The City of O'Fallon passed a bond for $21 million dollars for park improvements-does that sound like a goal of a passive green park? I do not live in the O'Fallon City limits and so cannot speak on the subject of crony capitalism. A business park is the prerogative of O'Fallon- However that is not a “passive nature park” & the O'Day Park should have a proper entrance. Preemptively, at our own expense we have relocated our entrance gates away from Highway DD. We have done this to get our vehicles and horse trailers off of DD as quickly as possible to avoid the increase in expected traffic and wrecks. We could only shake our heads when the MoDOT workers matched out signs with a lower speed limit sign (45 mph) -do not get me wrong, their sign is a good thing. Can MoDOT do more? Besides just giving O'Fallon the permission to mangle people on DD? For the safety of my family, and unknown strangers who I do not wish to see mutilated on the road way I am begging for some assistance. I do not wish the 300 parking permit rescinded. Although I would feel some satisfaction if the City of O'Fallon had to explain the parking additions. Those 1% changes Ed. The new park only has one entrance/exit. In the beginning the City should have been made to direct their concert traffic to the service road for Interstate 64 (only one mile east) and away from the “No shoulder narrow Highway DD” -- Route traffic away from the winery and beer hall traffic. If a new entrance is not feasible -please make the City put in a stop light at the park entrance. At least then people will have to slow down and the residents of “Country Day Lane” across from the park entrance will be able to turn west without risking their lives. Of course there will still be a line of traffic a mile long. Finally, since the City of O'Fallon passed a bond for $21 million dollars for park improvements. The money for both the alternate entrance and the stop light (both would be ideal) is in their coffers. And isn't one life saved worth the proper entrance and exit from the new Park? My goal is zero deaths. Thank you for any assistance to save the lives of my relatives & strangers. Back to the legal question of responsibility: Is MoDOT going to cover the expense of post traumatic stress of say when my brother is first to arrive at the scene of school bus versus a heavy quarry truck? And of course that of the distraught parents. Or the pain of my niece who might only have one broken arm but watches in horror as her screaming beloved horse is euthanized because of four broken legs? 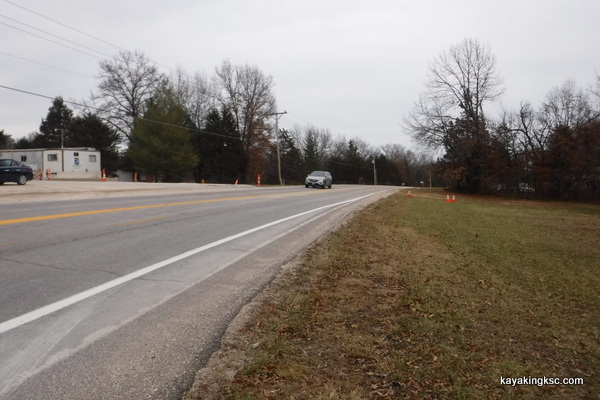 Or Me going to social media in anguish over my mother's death because O'Fallon and MoDOT allowed this engineering aberration of an intersection to exist? And.......If it is me you read about in the paper or on your phone, killed on deadly DD-do not fret, I will not be around to beleaguer incompetence or indifference. FYI, My mother paid for her own signs on Highway DD “Slow down or die” to save lives. My mother filed complaints with MoDOT to save lives. Seems like she should be one of the “Citizens” in your Blueprint propaganda statement. That makes her a community leader taking action. Preventable is the deaths at the O'Day Park entrance, that is if anyone really cares. The Missouri Highways and Transportation Commission (the Soviet style Politburo that controls the MoDOT) actually did reply to my letter. Dear Mr. Ryba: I wanted to let you know that we received your email correspondence. The Commission understands that Chief Engineer, Ed Hassinger, has considered and responded to pervious inquiries and the Commission agrees with his assessment. It is easy to believe some of that $21 million the residents O'Fallon agreed to waste on two parks..somehow made it to the coffers or pockets of the DOT. However I believe it is just laziness on the part of the MoDOT. Not corruption, but simply lazy and hard-headed stubbornness to ignore the concerns of citizens. Malfeasance or corruption: It is still Actus reus -Latin for the "guilty	act"
I will offer the of list names of nearly a hundred Missouri Department of Transportation workers or related traffic organizations who received my email plea and who decided it was in their best interest not to upset their Politburo to save just one life. Offering my condolences ahead of time to those families whose loved ones will be butchered at this park entrance and also to the shocked citizens who arrive upon a scene of human and equine destruction.